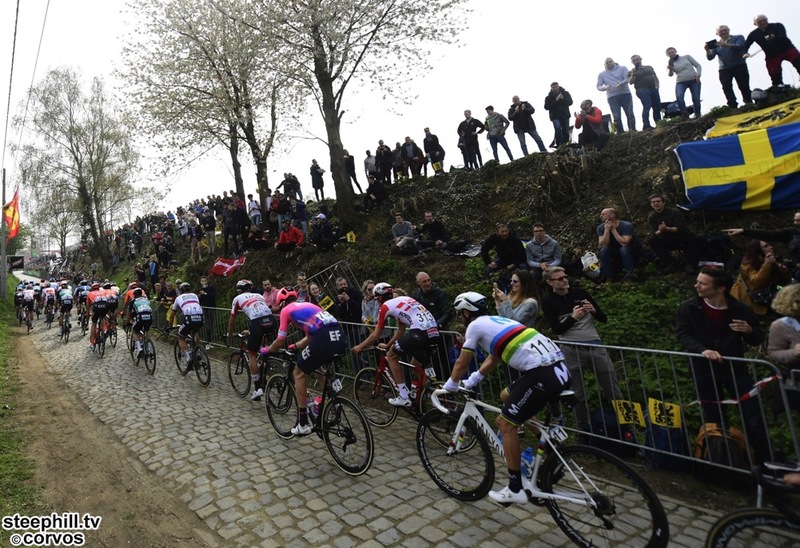 My favorite bike race of the year was run this past weekend the Tour of Flanders. Not sure why I like it so much but I do. One thing that is cool is the route. They essentially break the race up into two parts. 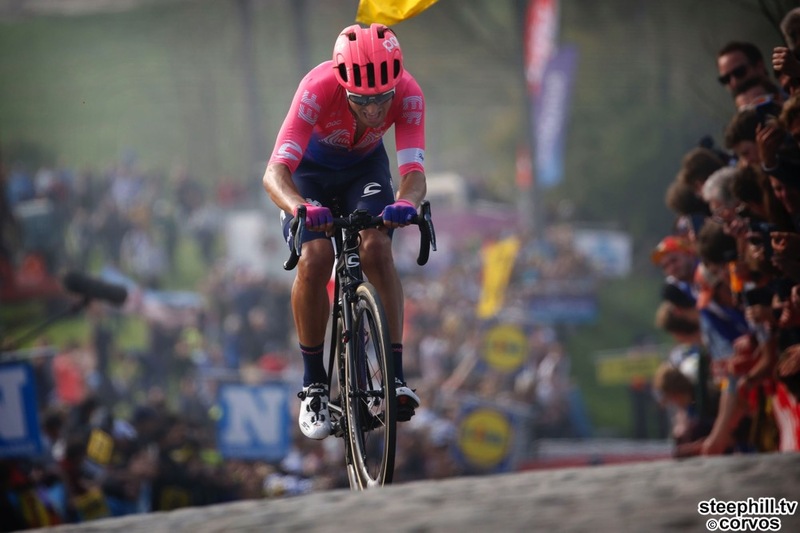 The overall length of the 2019 race was 267km that is 166 miles. The first half of the race is rolling hills and really just getting miles into the legs of the riders. Every year on the day before the race the route is open to the public and many people suggest if you go this is the part of the route you want to ride because it is pretty but you don't have the really tough climbs. If I ever got the chance, this is a trip I would love to take. Ride it one day watch it the next. Of course if you want to ride the easy part you want to watch at the difficult part. As they get into the second half of the race they start to hit cobbled streets and steep climbs. This is where the race is usually won and lost. This is where groups start to form and you start to see who is in contention to win. This year was no exception and all the big names were still in it heading into the last two climbs of the day. This is where Albert Bettiol, an Italian on an American team, made his move. With about 18 km left they came to the Oude Kwaremont and that is where Bettiol made his move. He alone was able to surge up the climb and left his competition behind. By the top of the climb he had a 20 second lead and that would prove to be enough. There were a few important things that set this up for Bettiol and a few that helped him keep the lead all the way to the finish. First he had two teammates with him as they navigated through the cobbles. One of them was part of the main breakaway of the day who actually fell back to help his teammates as they entered the final 25km or so. Having team numbers is very important in races like this as everyone is at their end and being able to us your numbers against the other teams is very effective. First thing that team EF did with their numbers is they put one rider at the front of the chasing group. At this point there were two riders up in front and a cluster of about 20 chasing. With the EF rider in front he set a fast pace meaning no one could attack in this area of the race and so they all came into the Oude Kwaremont together and strung out. It also meant that the others were a bit tired from keeping such a high pace. Then Bettiol attacked and immediately got a gap and the 10 second lead. With 18km to go and a group of say now 15 riders behind you, normally you are going to get caught. But this is where teamwork helped again. The guy who had been at the front setting the high pace was now out, he had used up all of his remaining energy doing that job, but there was still another EF teammate left. His job at this point is to get on the wheel of anyone trying to jump out of this group to try and catch up to Bettiol. This was Sebastian Langeveld and he did his job perfectly. He was always right there on the attacks that looked like they had a chance and of course his job is to simply sit right on the back wheel of the guy trying to make the move. So it means you are going to attack and give full effort to close that now 20 second gap, and you are going to drag along with you this other guy who is never going to give you any help. Which means once you catch up to the guy in the lead now you have two guys from the same team and one of them just road your wheel. I know that it seems silly to think the guy riding the other guys wheel is rested but it is true. The guy in front uses a lot more energy than the one sitting on the wheel. Anyhow this strategy killed all the attacks, this and the fact that everyone else was also marking all the other attacks. While behind they are all fighting among themselves Bettiol is able to simply ride as fast as he can up front. In the end this was how he won the race. You see it play out in cycling like this all the time and it is always fun to watch. No rider from the United States has ever won Flanders. Belgium of course leads the way as it is their most important race of the year. No American this year finished the race. The fall of US cycling is really sad and reminds me of the fall of French cycling back in the late 90's. I was watching this video and if I were teaching racers about their job as a teammate when the first guy is ahead I would show them the work that Langeveld does in this race it is simply perfect. My favorite moment one guy is at the front and putting in a good dig with everyone lining up behind him, who is second wheel Langeveld. When he flips his arm to say next guy come forward Langeveld just sits there. When the guy looks back to see who is next in line it is so deflating and suddenly the whole group slows down as people have to readjust to the situation. If you didn't care at all about time, could you finish this race? That's actually a serious question. Is it a deal where any regular rider could finish if he/she wasn't attempting to compete exactly? You mean during the race itself, no that is closed to the professional riders and teams only. They have a women's race and a men's race the same day. If you went on Saturday when it is open yes anyone can ride it and there is no time table. Even at my best I could never have finished a ride like this. The distance is one thing but then the cobbles and the steep climbs is something else. Elite amateur riders go over and ride the full course on that Saturday when it is open. Interesting. Yeah, I was wondering about whether it would be challenging to finish even outside the bounds of the race. I covered a triathlon down at Kentucky Dam one time, and one of the questions I asked one of the organizers was how many of the entrants actually finished. And the answer was either all of them or all but one of them. This really surprised me, because I was just amazed that anyone could accomplish such a feat. But this person told me that pretty much no one was going to enter and attempt it unless they already knew they were up to the challenge. And that made sense.